If you’ve been to one of our workshops, you know we emphasize the importance of paraphrasing and empathizing as critical listening skills, and therefore critical influencing skills. These are not mere nice-to-haves in your trusted advisor toolkit. Master these two skills—no kidding and genuinely—and you’ve got a really good chance of being seen by clients as more than just a smart problem solver. “Genuinely,” of course, is a key word, which can be a challenge. A question I just got again recently is this: What should you do when you don’t actually feel empathy for a particular person in a particular instance? The answer is straightforward. Sort of. If you don’t feel it, don’t fake empathize. They’ll smell your inauthenticity from a mile away. But by the same token, please don’t choose to do nothing, which is what most smart problem-solvers opt for in an awkward situation. You can see there are a lot of possibilities that don’t rhyme with, “Wow, that must be sooooo frustrating,” said with great feeling and fervor. 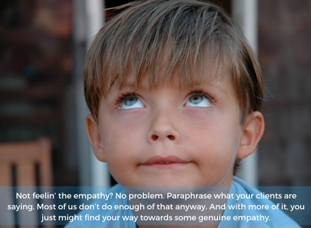 Reflecting back what our clients are sharing with us is a way to create connectedness and rapport, especially when there’s emotional content (and when isn’t there, really). It’s a way to strengthen relationships while revealing more and better data for problem solving. It’s a way to show we’re confident enough and capable enough to engage emotionally as well as intellectually. Most of us don’t do enough paraphrasing anyway. And with more of it, you just might find your way towards some genuine empathy. Side note: If you find yourself struggling more and more to be empathetic with others in general, it might be time for a reset—maybe a vacation, a new focus on self-care, or a role change. You’re in a services role because you care about people. The absence of empathy can be a sign it’s time to recalibrate. This week, paraphrase five times more than you normally would. See what happens. 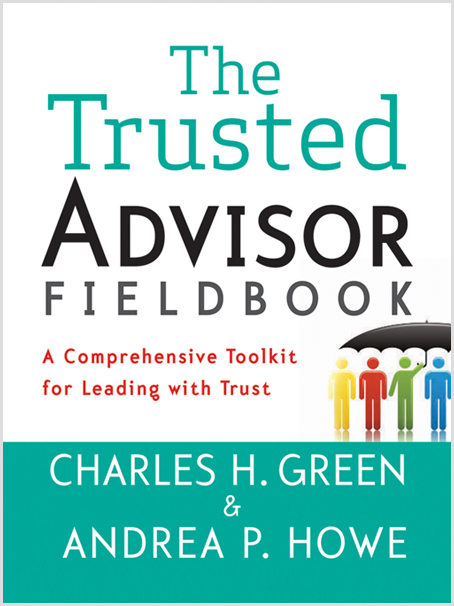 Find out why you shouldn’t believe what they say about listening and sales, from our friends at Trusted Advisor Associates, or read about one marketing company’s compelling act of empathy in Chapter 6 of The Trusted Advisor Fieldbook.